What's your stance on Valentine's Day? Love it? Hate it? My sentiments are somewhere in the middle. When I was in elementary school I loved addressing Valentines and making treats for class parties, but every year I was disappointed when I failed to receive a Valentine from the boy I had a crush on from kindergarten through eighth grade. (Such enduring, unrequited love. Also: awkward.) But for a "Hallmark holiday" I think it's a fine one. I am a hopeless romantic after all (see: childhood crush), and I can't fault a day devoted to the exchange of sweet treats and sentiments. Plus, it's a wonderful reason to get into the kitchen and bake something special for the ones I love. (And thankfully not for an elementary school party). 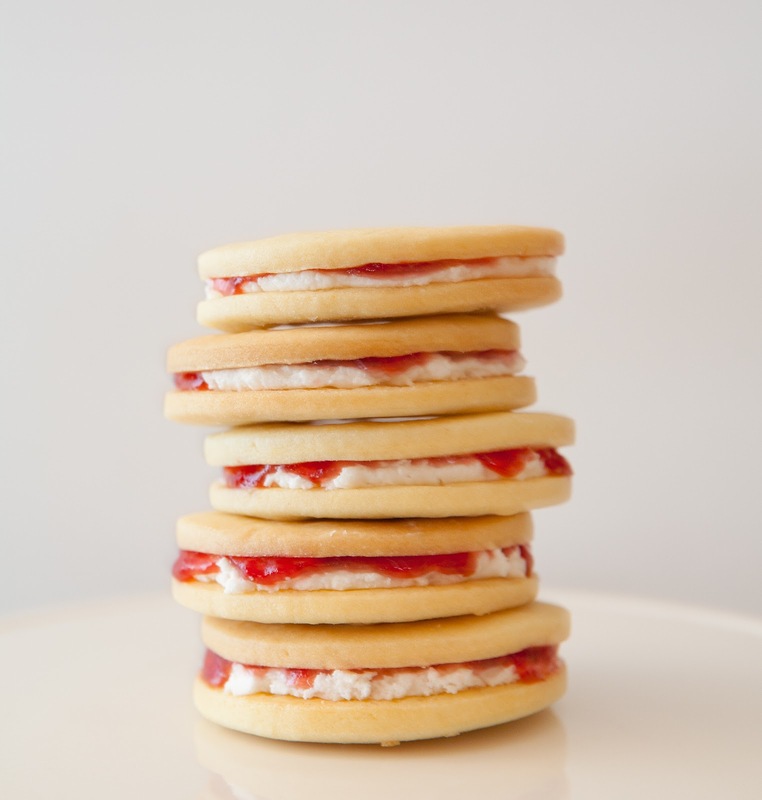 These Strawberries & Cream Sandwich cookies are a nod to my husband's favorite South African biscuit, Bakers Strawberry Whirls. Strawberry Whirls are not readily available in the United States, and the last time we got our hands on them (thanks, Rose! ), my husband was saddened to find that the manufacturer had changed the recipe. What was once a beloved tea time treat is now a chalky biscuit whose cream and strawberry filling leaves an unpleasant chemical aftertaste. So I did what any self-respecting baking enthusiast (and perfect wife, ha ha) would do: I came up with a homemade version. Because I don't have a press or mold for making cookies with a swirl pattern like actual Strawberry Whirls, I opted for a rolled and cut cookie. The result is a sort of hybrid between Strawberry Whirls and another iconic Bakers treat, Jolly Jammers. I cut hearts in the tops for Valentine's Day, but you could cut out a small round a la Strawberry Whirls, a silly face like Jolly Jammers, or any shape you like. No matter what you call them -- Strawberry Whirls, Jolly Jammers or Strawberries & Cream Hearts -- these cookies are light and delicious, with no chemicals or strange aftertaste. The dough is fantastic in that it can be re-rolled and cut several times without losing its light, flaky texture, and holds its shape when baked. 1. In a In the bowl of a stand mixer fitted with the paddle attachment, beat the butter, confectioners' sugar and egg yolks until light and creamy, about 3 minutes. Add the vanilla and beat until incorporated. 3. When you're ready to bake the cookies, heat the oven to 325 degrees F. Remove the dough from the plastic wrap and roll out on a lightly floured surface to a scant 1/4 inch thickness. Cut cookies with a 2-inch round biscuit or cookie cutter. Use a heart-shaped mini cutter to cut hearts out of half the cookie rounds. 4. Transfer cookies to a parchment- or silicone-lined baking sheet and bake for 15 to 20 minutes or until lightly golden, rotating the sheets halfway through baking. Allow to cool completely before filling and assembling. 5. To make the cream filling, beat together the butter, shortening, sugar and vanilla until light and fluffy, about 3 minutes. 6. To assemble the cookies, use an offset spatula to spread the cream filling on the underside of the cookies that don't have hearts cut out of them. The cream filling should be about 1/4 inch thick and not quite reach the edges of the cookies. 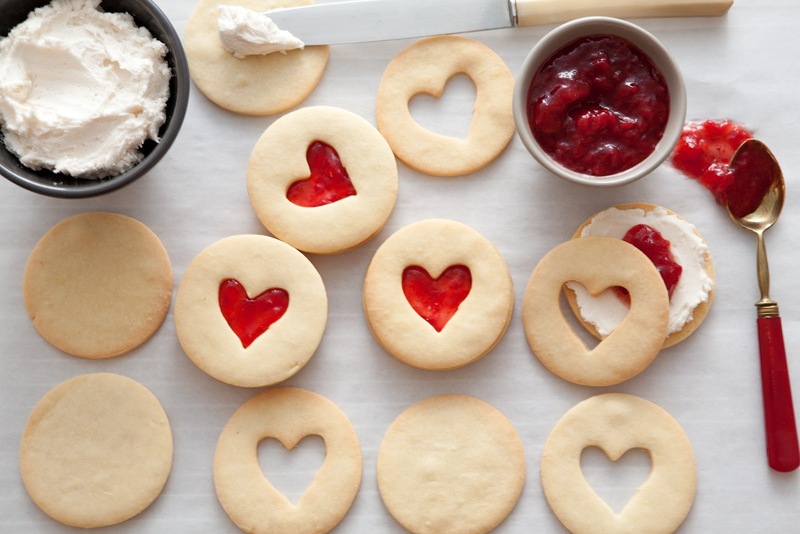 Top each cookie with a layer of strawberry jam and a heart cutout cookie.